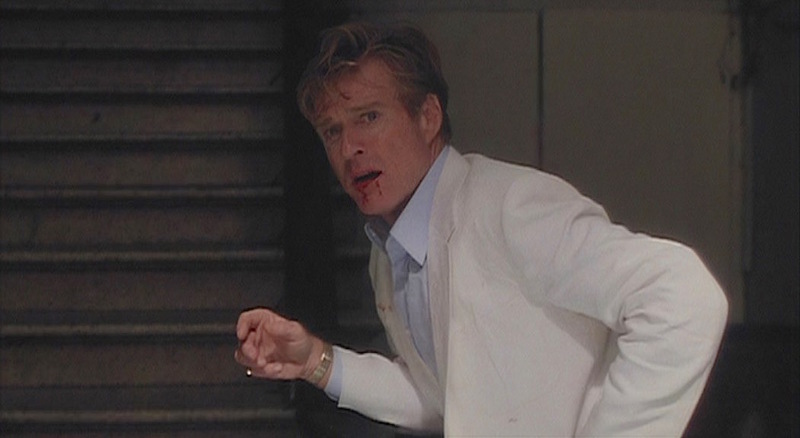 Havana, Sydney Pollack’s 1990 ode to Casablanca, stars Redford as a cynical American gambler who finds romance in the Cuban capital on the eve of the country’s revolution. The object of his affection is Roberta “Bobby” Duran (Lena Olin), a revolutionary sympathizer who is forced to determine if her heart remains with her husband and the revolution or the chance of a life in America with Redford’s Jack Weil. Jack Weil’s wardrobe of flashy suits and silk sport jackets are ideal for a smooth professional gambler making the rounds of poker tables in late 1950s Havana. 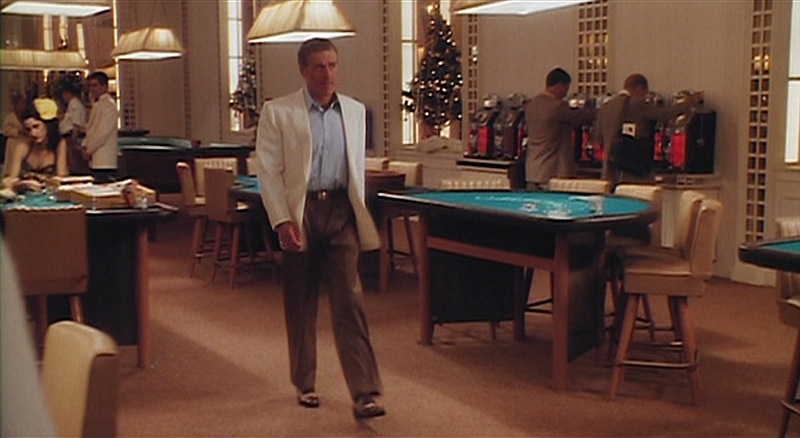 However, one of Jack’s most timeless and accessible outfits is briefly seen over the course of a few daytime scenes as he meets with casino boss Joe Volpi (Alan Arkin) and begins making arrangements to secure Roberta’s escape from Cuba. Jack’s single-breasted jacket is light cream linen, appearing on screen to be just a few shades warmer than pure white, and was custom made for the production by Western Costume Company. 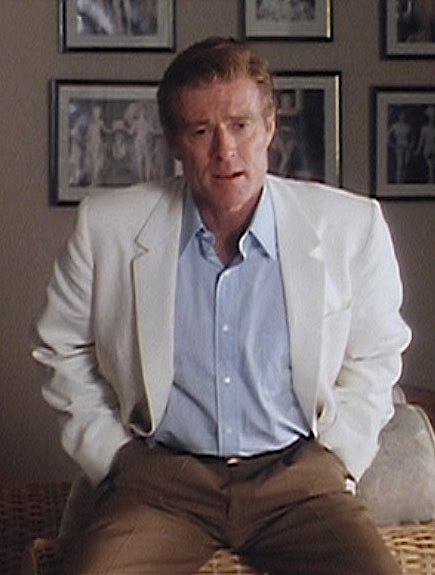 The ventless jacket is cut consistent with Robert Redford’s other tailored wear in Havana as well as trending ’50s styles with wide, padded shoulders, roped sleeveheads, and narrow notch lapels that roll to a low two-button stance as well as sporty patch pockets on the left breast and both hips. 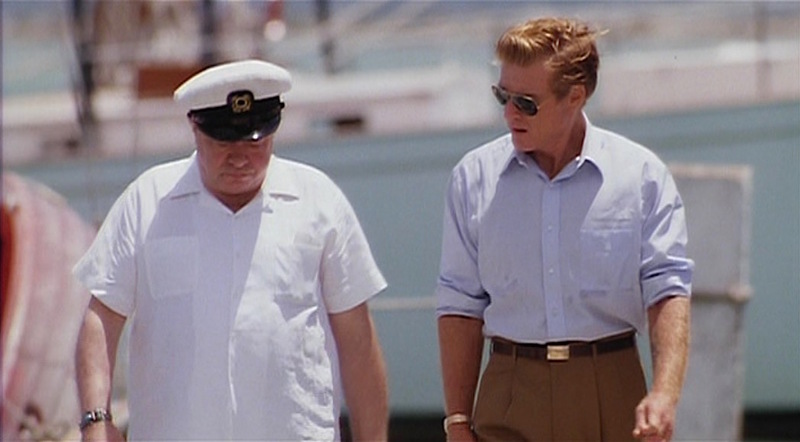 Jack’s light blue cotton shirt was made by Anto Beverly Hills, then known as Nat Wise of London, who has created shirts for Robert Redford since the early years of his career. This shirt’s point collar is less distinctive than Jack’s other shirts with their large curved “Mr. B.” collars. The shirt has a wide front placket with mother-of-pearl buttons, a breast pocket, and button cuffs that he unfastens when he rolls up his sleeves after removing the jacket. As an alternative to more commonly seen khaki trousers, Jack wears a warmer, darker shade of tobacco brown slacks. These reverse-pleated trousers have belt loops dropped about a quarter-inch from the top of his waistband, where he wears a 1″-wide dark brown leather belt with a gold rectangular “box-out” covered buckle. His trousers have side pockets and are finished with turn-ups (cuffs) on the bottoms. Spectator shoes aren’t for everyone, but Jack Weil is the type of dresser who owns not one but two pairs of these two-tone lace-ups. With this outfit, he wears the more “subtle” spectator shoes, a pair of Bragano five-eyelet wingtip oxfords in walnut brown leather and tan nubuck that he also wore previously with his tan gabardine suit. Little is seen of his hosiery, though auction listings for the outfit describe an unfortunate choice of black socks. Brown would have been a more visually appealing choice of socks, coordinating with the warmer tones of the outfit while also continuing the leg line from his brown trousers. Jack Weil in his natural habitat… though the juxtaposition of Christmas decorations with such a classic warm-weather outfit could be seen as a bit unnatural. 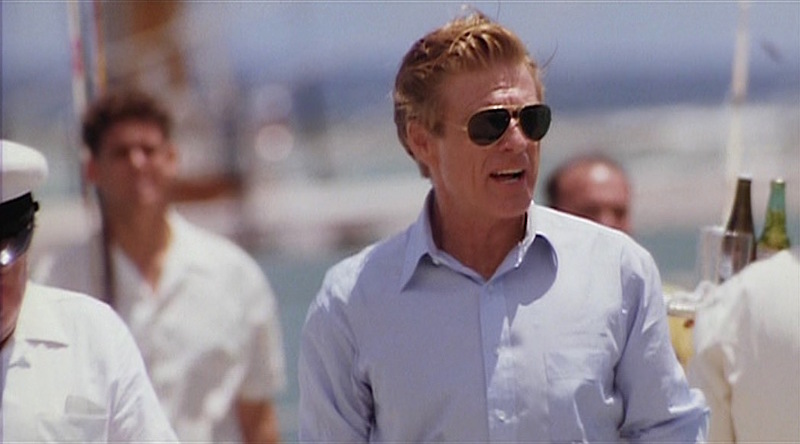 Jack wears a pair of large gold-framed aviator sunglasses with dark lenses, which I’ve read were made by Ray-Ban. Originally developed for American military pilots in the late 1930s, the aviator is a suitable choice for Jack Weil with his military background and adventurous spirit. Per the traditional image of a successful gambler, Jack wears gold jewelry and accessories. Havana is one of the few Robert Redford movies where the actor doesn’t wear his signature silver ring that he received as a gift from the Hopi tribe in the late ’60s, instead only wearing a gold signet ring on his right pinky. Jack’s watch is also yellow gold with a round gold dial and a flat gold bracelet. The hell of it is that he’ll never be able to get those bloodstains out of his white linen jacket. 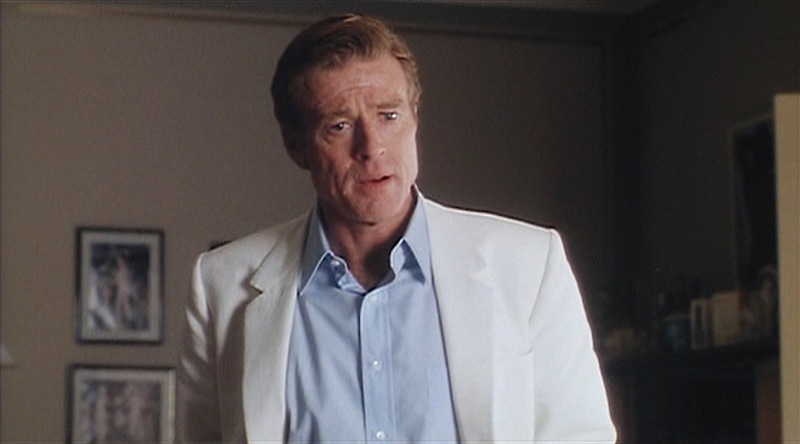 Robert Redford’s costume as Jack Weil in Havana (1990), sourced from Julien’s Auctions. In November 2015, the whole outfit was auctioned by Julien’s Auctions with additional descriptive notes and photos. When not sporting flashy colored silk or boldly printed ties, Robert Redford’s Jack Weil showcases a unique example of warm-weather business casual, incorporating subtle flair with classic menswear staples. Check out the movie… and dig those white jackets and pants out from the back of your closet! Bar the padded shoulders, pleats, spectators and belt it’s a nice outfit. If the blazer was a single button, unstructured, trousers had a slightly lower rise, spectators were replaced with lighter coloured loafers and a different belt I could see someone wearing it at any given time. Would be interested to see some of your thoughts on updating some outfits in a section after how to get the look with how you could see some outfits work in a more modern setting, or even sealing their timelessness.